August 16, 2011 - The U.S. Navy/Northrop Grumman U.S. Air Force flight test team tasked with evaluating the performance of the X-47B Unmanned Combat Air System (UCAS) carrier demonstration aircraft has been awarded the 2011 James S. McDonnell Award for Outstanding Team Achievement in the Field of Flight Test Engineering by the Society of Flight Test Engineers (SFTE). 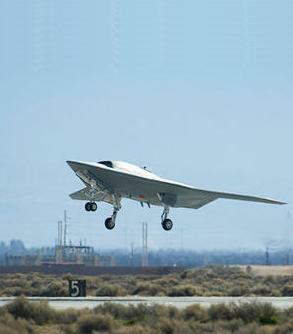 The Northrop Grumman X-47B is a demonstration Unmanned Combat Aerial Vehicle. The X-47 began as part of DARPA's J-UCAS program, and is now part of the United States Navy's UCAS-D (Unmanned Combat Air System Demonstration) program to create a carrier-based unmanned aircraft. Unlike the Boeing X-45, initial X-47A Pegasus development was company-funded. The original vehicle carries the designation X-47A Pegasus, while the follow-on naval version is designated X-47B. The X-47B is planned to have a three year test program at Edwards AFB, California and NAS Patuxent River, Maryland, culminating in sea trials in 2013. The aircraft will be used to demonstrate carrier launches and recoveries, as well as autonomous in-flight refueling with a probe and drogue. The X-47B has a maximum unrefueled range of over 2,000 miles and an endurance of more than six hours. Founded in 1950 by aerospace pioneer James S. McDonnell, the Foundation was established to "improve the quality of life," and does so by contributing to the generation of new knowledge through its support of research and scholarship. The Foundation awards grants via the Foundation-initiated, peer-reviewed proposal processes described in the 21st Century Science Initiative. The team was recognized for testing innovations related to the evaluation and flight demonstration of the tailless X-47B unmanned aircraft earlier this spring, and to the July 2 demonstrations of aircraft- and ship-based precision navigation and landing systems that will enable the team to safely launch and recover the X-47B on a Navy aircraft carrier in 2013. Members of the team from Northrop Grumman and Naval Air Systems Command (NAVAIR), Patuxent River, Md. accepted the award at an SFTE banquet held Aug. 11 in Seattle during the organization's annual symposium. Northrop Grumman is the Navy's prime contractor for the Unmanned Combat Air System Carrier Demonstration (UCAS-D) program. "Receiving this award is truly an honor for the UCAS-D program," said Janis Pamiljans, vice president and program manager, Navy UCAS, for Northrop Grumman's Aerospace Systems sector. "It recognizes the outstanding mix of collaboration, creativity and engineering talent that characterizes our government/industry flight test team. ?By defining and implementing a new family of test methodologies, the team has successfully positioned us to evaluate the performance of a tailless, autonomous, low-observable relevant unmanned air system in the complex and very challenging carrier environment." Named after American aviation pioneer and McDonnell Aircraft Corporation founder James Smith "Mac" McDonnell, the McDonnell award is given annually by SFTE to honor excellence by flight test teams. Northrop Grumman has previously shared in this award, first in 2007, as part of a Boeing Corporation-led flight test team for the EA-18G aircraft in 2007, and again in 2008, as part of a Northrop Grumman/Navy E-2D Advanced Hawkeye test team. SFTE is a fraternity of engineers whose principal professional interest is the flight testing of aerospace vehicles. The organization's chief objective is to advance flight test engineering by providing technical and fraternal communication among individuals, both domestic and international, in the related engineering fields of test operations, analysis, instrumentation and data systems. The UCAS-D program is designed to demonstrate the operation of a tailless, low-observable, autonomous unmanned aircraft to and from the deck of an aircraft carrier, including launch, recovery, bolter and autonomous aerial refueling. The program also plans to mature technologies required for future Navy unmanned air system programs. The Navy awarded the UCAS-D prime contract to Northrop Grumman in August 2007. The contract calls for the development and flight testing of two strike-fighter-sized X-47B unmanned aircraft. In 2013, the program will demonstrate the first carrier launches and recoveries of a tailless, unmanned aircraft. Autonomous aerial refueling demonstrations are planned for 2014. Not The Way To Operate On ?Final Approach? Are Airline Carriers Enjoying Calm Before The Storm?